RICHMOND, ME – The Fund for the Advancement of Sustainable Lobster, the industry group that pursued and obtained Marine Stewardship Council (MSC) certification for Maine lobster earlier this year, is now offering all dealers and processors in the state the opportunity to display the MSC ecolabel on their Maine lobster products. Under the MSC certification process, the fund is considered the “client group,” the first link in the “chain of custody” the MSC uses to assure buyers further down the chain, as well as end-of-the-line consumers, that lobsters carrying the label are indeed MSC-certified Maine lobsters. On Oct. 8, the fund announced it was offering a licensing agreement that will allow other businesses to become licensees and display the MSC label. 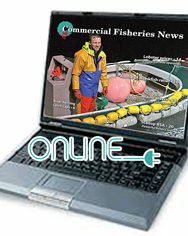 Read the rest and much, much more in the November issue of Commercial Fisheries News. Read online immediately and download for future reference.